Inspired by the Gartner Hype Cycle report, HACT Innovation Launch Pad have created our own take on the state of technology specifically for the housing sector. As with Gartner’s reports our housing hype cycle is a guide to the maturity and level of adoption of new technologies in the UK housing context. Last year the connected home and big data were the big thing in housing. Both these technologies are now beyond the peak of their hype as housing providers and the technology community focus in on finding business models and deriving value from these technologies. On the way up are the next wave of innovations including 3D asset management, distributed energy technologies and intelligent agents – all these offer a glimpse at the future of housing and those such as housing as a platform invite us to radically re-imagine housing delivery. Reaching the ‘plateau of productivity’ are technologies associated with digital transformation that are now widely adopted, in this space innovation will be driven through integration with emerging technologies such as emotion recognition and true integration with the connected home. As technologies move along the curve there are many opportunities for housing providers to get involved with experiments and trials that will help build capacity and learning within their organisations that will provide the basis for decision making and adoption as technologies reach maturity. With new technologies constantly emerging the hype cycle is not complete! So keep a look out for updates to reflect the latest developments in technology for housing. After reaching its hype cycle peak in early 2016 the connected home makes its way through the inevitable trough of disillusionment as housing providers, having got their hands stuck into a range of pilots, consider the current market technologies not yet (quite) of the quality, reliability and price point to be the long term solution and challenges around integration into existing business systems and processes remain to be resolved. The closure of 365Agile’s connected home business has increased awareness of the risks associated with what is still a very immature market. However this is a technology which looks like it will make it through the trough and into productive deployment within the foreseeable future – the growing commitment of large corporates like Telefonica, Microsoft, British Gas, Amazon, Samsung and others to this market means that it is a technology that will not go away. In the meantime, there is still plenty to be learnt from connected home trials and pilots in terms of building capacity and preparing housing business for the connected home technologies market maturity, which is like to start to be reached in the next 1-2 years. 3d point cloud based laser scanning has for some time been capable of creating quick, relatively affordable and incredibly detailed renderings of buildings and landscapes but has been limited in its deployability beyond expensive workstations due to the huge amounts of data involved in manipulating billions of points of information. As this sort of technology starts to combine with almost limitless cheap storage, machine learning and more and more efficient streaming technologies, we are likely to see asset management moving from static one dimensional numeric databases into the 3rd dimension. Asset data will increasingly be held as 3 dimensional models, offering a step change in terms of available management information, and practices like surveying will be disrupted as machine analysis of scanned assets replaces on the ground humans, and much faster than many yet realise. With early pilots already starting to take place in housing providers, early approaches to using this technology are likely to start to be deployed in a business context within the next 12 months and increasingly enter the mainstream in the next 4-5 years. Successful trials of UAVs (drones) to carry out stock condition surveys have shown that the image and thermal data capture capabilities of these devices can provide a rich source of asset data. The main short term constraints are CAA regulations and the capability for automated machine analysis of the data captured. UAVs in housing are unlikely to maintain the hype until regulation and data analytics capabilities catch up. When linked to 3D asset management, it holds out the prospect of some revolutionary changes in the quality, volume and cost of collecting stock data. If the government determines it is happy for commercial UAVs to take to the sky in significant numbers. Government and a wide range of open-data focused organisations have made heroic efforts in opening up data but the key to deriving value from this exercise is defining problems that open data can be applied to. Whilst some solutions – like HACT’s Community Insight– have built a significant userbase across housing and local government providing easy access to data, this success has not been matched in other sectors – it is increasingly clear that simply opening data does not on its own promote innovation or create better services, the tools need to be created to analyse and use it. Housing providers who are combining open data with other data they hold are deriving the most value from the wealth of open data now available. Long term the housing sector may face continued pressure to open up its own data – if they do so, they will first need to consider whether data standards are needed to make sense of the data they hold, and how it might be presented in ways which offer maximum potential value, rather than simply publishing data for its own sake. Whilst solar energy is now a market that is well understood by many housing providers (if much less attractive than it was as a consequence of changes to government policy), the biggest new growth area in a residential context will be energy storage as much as energy generation – enabling the smart balancing of loads across the grid in ways not previously possible.. New demand side energy management technologies such as ChargeSync have the potential to open additional revenue streams for housing providers prepared to open up their networks of homes to assist the grid in managing load. Opportunities exist for housing providers to work with energy companies or become energy companies themselves. When the smart meter launch finally gets going and time of use tariffs are introduced this will become a very active market. Chat bots are the hot new technology for 2016 with developers rushing to build software robots to takeover all kinds of tasks currently carried out on the web, phone or email. While many of these applications are spurious – (is it really easier to order a pizza via facebook messenger?) housing offers a context where doing away with apps and using machines to use natural language to understand resident requests makes digital services radically more accessible to those non tech literate and could be the final piece in the digital channel shift agenda. With new housing start up Fuzz Lab developing the first intelligent agent to assist with repairs diagnosis, it may not be long before we see the first deployment of bots in a UK housing context. Whilst “big data” was at the very top of every sector’s hype cycle only 2 years ago, it has spectacularly fallen off most in the last twelve months, as realism about the problematic nature of existing business data and increased excitement about the opportunities opened up by intelligent agents and machine learning replace big data ambitions, whilst advanced data analytics as a discipline has gone mainstream faster than anyone would have expected. Housing has gone through a similar learning journey as early big data experiments – such as the HACT/Microsoft initiative to create a shared housing data repository failed to get off the ground as the quality of most housing data contributed proved of too low a quality to offer significant insight. However, since then we have seen a major uptick in the deployment practical data analytic applications, with organisations like Mobysoft developing a range of practical business data insight tools, and HACT taking the learning from its own Big Data initiatives to apply them to business data analysis projects focusing in particular on the relationship between customer profiles and repair costs across a range of larger providers. Car sharing has gone mainstream and with the rapid increase in charging points in cities electric cars are also on the rise. Low cost care sharing services that offer value to both housing businesses and residents are now easily implementable and offer social landlords an opportunity to engage in green projects that enhance the lives of residents. The market for mobile working solutions has matured and it is now an expectation that housing staff are able to access data from back end systems when out and about. Workers can now often use their own devices to securely access these these systems and the now multiple software providers operating in the space compete to make this process increasingly seamless and feature rich. With many sectors facing significant disruption from the wave of new platform businesses – whether Uber for transport, Amazon, Ali Express and Ebay for commerce, Air BnB for short term letting or the myriad of niche and B2B platform based businesses that have emerged over the last 5 years – it seems strange that housing has not yet begun the process of rethinking how it delivers homes, sticking closely – for now – to a model of delivery that is in many ways decades old. Expect to see experiments in “platform” approaches to housing starting to emerge over the next couple of years. If they succeed, expect the disruption that has occurred in our retail markets to spread to the housing sector, and quickly. With services like Kairos starting to lever the power of machine analytics to commercialise emotion recognition, we’re likely to start to see some very interesting applications emerging over the next 3-4 years. Whether housing providers will want to manage the mood of customers entering and leaving their offices – they will have that capability available to them. Longer term, we may see more practical uses of this technology around housing and service design as market research is transformed – enabling real time feedback on customer responses to new products and services in ways that just aren’t possible at the moment. With 3D modelling and advanced manufacturing now being turbocharged by increasingly cheap and powerful data storage and processing and affordable robotics, we are likely to see a step change in approaches to building design and construction over the next 5 years. We’re already seeing companies like Buro Happold trialling intelligent machine designed social housing in Europe, making use of standardised components to deliver infinitely flexible design, but with the same speed and cost advantages as more traditional and less flexible off site approaches. 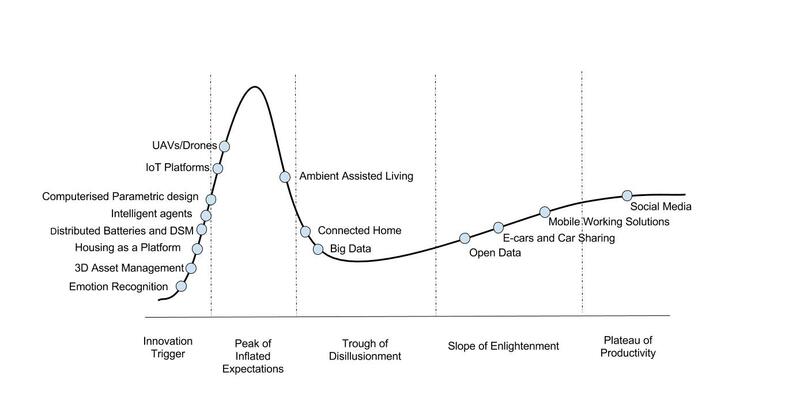 As the connected home drops off into the trough of disillusionment IoT platforms climb the hype cycle as the technology which could help bring the connected home to maturity. IoT platforms join the dots between disparate hardware with diverse connectivity requirements enabling housing businesses to draw iot data to one central cloud based hub where basic analytics and alerts can be created. IoT platforms come with an ecosystem of apps to help quickly build functionality and their core component – an open API allows housing providers to build just one connection to the platform to access many devices. As numerous platforms do battle to create the most integrations we are likely to see some platforms flourish and others flounder. While hardwired assisted living devices are commonplace in supported housing, the new era of light touch sensor based assisted living tech is still to make a significant impact in housing. As it stands many of the solutions on the market come as a hardware-software package but the real intelligence is all in the software. The ability to understand if an older person’s daily routine has changed from a sensor needs to become hardware agnostic to find its way into homes. Once IoT platforms and connected home technologies mature a space for bolt on software based ambient assisted living services will open up. Housing providers now use social media as key means of communication with residents, the rest of the sector and the wider community. Social media an an outward facing live source of information and is increasingly used as a substitute for phone, web and face to face communication. Social media has reached a steady state in its current form and the next wave of innovation in this space will come from the shift towards automated machine management of social media where bots will triage complaints and solve many simple queries.